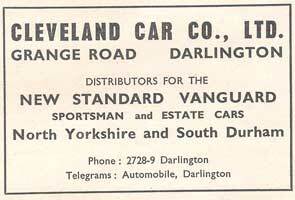 The Standard-Triumph dealer who originally supplied the car to its first owner was the Cleveland Car Co. Ltd, in Darlington, N. Yorks. "TODAY'S Memories touches upon the Cleveland Car Company which was housed in one of Darlington's most distinctive buildings on Grange Road. 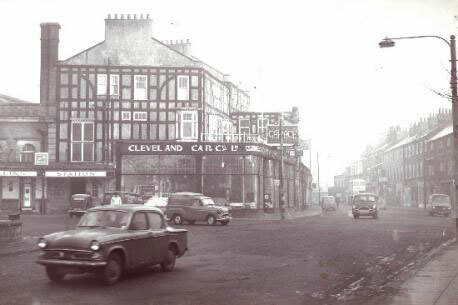 Until the mid-1960s, of course, Grange Road was on the Great North Road, and so ideally placed for passing motor trade. The half-timbered garage is one of the buildings I would love to have seen, but it became unsafe in 1974 and what is now Blockbuster's video shop replaced it. The CCC business remained in Grange Road until 1971. It regarded itself as the creme de la creme of garages. Right into the 1960s it refused to accept new vehicles delivered on a transporter because it said the movement of the transporter's floor, to which the car was tied, caused engine oil leaks in later life. In November 1971, the CCC was transported to Bland's Corner, near Stressholme Golf Club. In 1986 it became part of the Reg Vardy empire which still operates at Bland's Corner (where, curiously, it inflates a giant King Kong every day, but that's another story)". 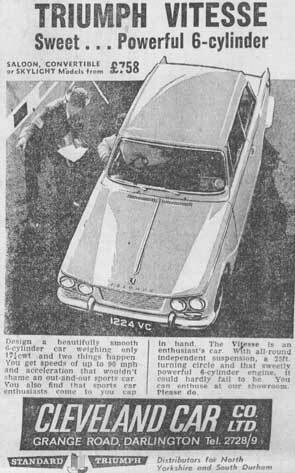 In the above photograph, which appeared with the article, can be seen a Standard 8 or 10 Van outside the showroom". 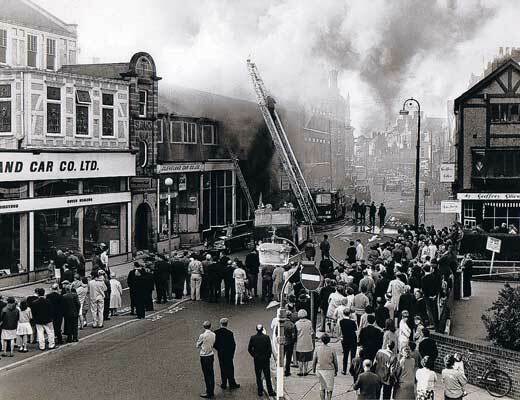 Above is a picture of a fire near the Cleveland Car Co. Ltd., in Grange Road, Darlington taken by The Northern Echo captioned "WELL ABLAZE: A crowd gathered on July 8, 1967, to see the drama at the Duplex garage on Grange Road, Darlington". Below are some period newspaper adverts.